Sometimes the name of an apple says it all. Honeycrisp is “college educated,” developed by the University of Minnesota. These apples are honey sweet (with a touch of tart) and amazingly crisp, this popular newcomer is a cross between a Macoun and a Honeygold. Honeycrisp’s skin is a distinctive mottled red over a yellow background, with coarse flesh. This apple is good for snacking, salads and sauce-making and stores well.Kids love the taste, and it’s easy to see why this recent variety has continued to grow in popularity since its 1991 introduction in Minnesota. More Honeycrisp trees are being planted every year in New York to increase the annual harvest. Supplies are limited but growing with harvest beginning in September. Honeycrisp apples are harvested in late September. 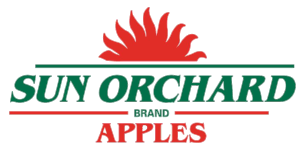 You can find Sun Orchard Honeycrisps in retailers September through January.